2011 November archive at Blue Cooks. Saute diced onion until soft and browned a bit. Add remaining ingredients and cook over low heat until cheese is melty and you see the face of the Virgin Mary when tasting it. Add more heavy cream if needed to thin it out a bit. This cake turned out far better than I expected – I had two peeps at work request a spice cake for their birthday in the same week (what are the odds!). This is what I came up with. 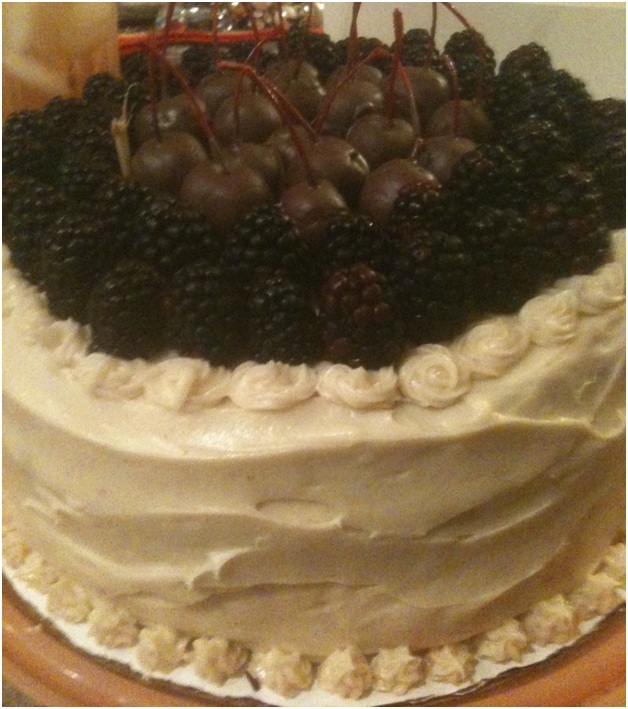 The blackberries are the perfect complement to the spice cake and the jam soaks into the cake layers making it moist and delicious (I recommend making this cake 1 day before you need to serve it). I actually got a little lazy. Which is no surprise. I made a double recipe of the spice cake on a Saturday and froze the layers after they cooled. The day before I brought them to work, I whipped up the frosting, removed the layers from the freezer, and fancied the cake up with jam, frosting, and fresh blackberries. Kathryn is a dear friend of mine, and for her cake I dipped maraschino cherries (with stems!) in chocolate and added them to the top of the cake. Just because she loves them. Use my favorite shortcut and spray the pans with Bakers Secret (loooove this stuff). OR – Lightly grease 2 (9-inch) cake pans. Cut 2 (9-inch) parchment paper rounds and line the pan bottoms. Grease and flour the parchment rounds. Cream the brown sugar and butter. Add the oil in a steady stream with the mixer running. Add the egg yolks, 1 at a time, beating well after each addition. Sift the flour, baking soda, baking powder, spices and salt into a bowl. Alternately add the flour mixture and the buttermilk to the batter, mixing well. With the electric mixer, in another large mixing bowl, beat the egg whites until stiff peaks form, then fold them into the cake batter. Pour the batter evenly into the prepared pans. Bake until the center springs back when touched, about 25 minutes. Remove from the oven and cool on wire racks. After the cakes have cooled, invert them onto sheets of parchment paper. Slice each cake in half and set aside. Spread a layer blackberry jam over 3 layers of the cake. Place the layers of cake on top of each other and top with the fourth layer of cake. Frost the top and sides of the cake with the cinnamon cream cheese frosting. Garnish with fresh blackberries. 16 ounces cream cheese – COLD! Trust me on this. Have the cream cheese cold and the butter at room temperature. In a medium bowl, beat cream cheese, butter, and vanilla until blended. Add sugar one-third at a time and beat just until smooth and the desired consistency. If frosting is too stiff, beat for few seconds longer. Do not overbeat. Stir in the cinnamon. This keeps, refrigerated, for about 1 week. This cornbread contains all three of the primary tastes that Texans love: savory (bacon grease), sweet (creamed corn), and spicy (chipotle peppers). If you don’t like spicy leave out the peppers, but you are missing a way to jump start your metabolism if you don’t use peppers. You are also missing the way the your brain starts firing “WOW” messages to the rest of you. Heat oven to 375 degrees. Put iron skillet in oven and add 2-3 Tablespoons bacon grease or oil. Heat until hot but not smoking. Place dry ingredients in mixing bowl and whisk together to distribute evenly. Add oil, whisked eggs, creamed corn, sour cream, cheese, cayenne and chipotle peppers. Whisk together just until blended. Pour batter into heated iron skillet, top with cracked black pepper, then bake until golden brown, approximately 30 minutes, and remove from oven. Coat top lightly with salted butter, and allow to cool for 5 minutes. Cut into wedges and enjoy! This recipe will also make wonderful corn muffins!